The steroids eventually began to fail in keeping Talon’s counts up and she was given several rounds of IVIG which also failed. Rituximab finally managed to keep her counts at safe levels and feeling better for a few months until she began menstruating. Severe cramps and heavy bleeding sent Talon back to the doctor and after several months, she was diagnosed with Von Willebrand disease and put on birth control to help manage the bleeding and pain. Although the bleeding was controlled, Talon continued to experience pain and while away on a trip to Disney, it became more intense and another visit to the doctor uncovered endometriosis. To control the effects of her latest diagnosis, an intrauterine device was inserted, which later was removed due to cysts that had formed around the IUD. Unfortunately for Talon, this was only the beginning of more surgeries and diagnoses to come. 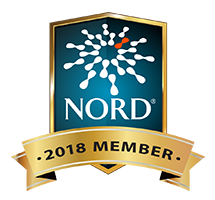 In the years that followed, Talon had several surgeries to remove her appendix, gall bladder and left ovary and this year, after the appearance of a butterfly rash, was also diagnosed with Lupus. 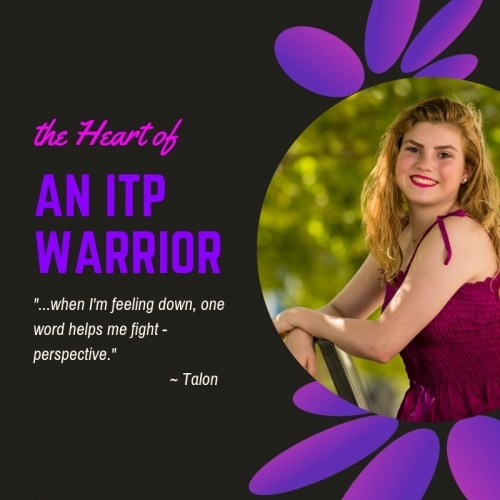 Although Talon was dealing with multiple health issues, her ITP remained under control. It was shortly after being diagnosed with Lupus that her platelets crashed to 13,000 and the ITP had returned. This latest bout with ITP has delivered more hospitalizations, treatments including IVIG and steroids and she also had a port installed. “It’s tough,” said Talon. “I had my first panic attack from dealing with all the pain, and depression has become my biggest struggle, but you just have to keep forcing yourself to go out and to try – even though the fatigue and pain from all of my issues brings me down, I’ve learned I have to fight,” she noted. Like many who deal with chronic illness, Talon cites the many doctor visits, feeling like a guinea pig, lack of answers, loneliness and mounting anxiety as the culprits of her despair. “Your needs and diagnosis change you. Sometimes I feel like I’m crazy because no one knows what’s wrong with me and more things keep popping up, but my family and friends are what help get me through. My mom is why I’ve gotten through everything. You lose friends who don’t understand what you’re going through, but then there are friends like Lisa and Cassidy who make me feel better. They understand me, support me and help me keep fighting,” she said with a giggle. “My friends and family make me happy. I love to hang out with my friends – like when Cass comes out to visit or when we Facetime or have a game night with my family. I also love music – it’s a big part of my life – and even though I can’t do all of the things I could before all of this, I find happiness in what I can do,” she said proudly. “I’m also so grateful for all the people that PDSA has brought into my life. I felt so alone when I first got diagnosed and it just so happened that ITP Conference was in Colorado that year. I met all these people that I still talk to today and my mom was able to meet other people that understood what she was going through too. I still go to conferences and love to meet people there – it’s great to be with people who know what you’re going through. I met Cassidy Gallo there and she is one of my best friends in the whole world,” she said happily. Although life has dealt more than its fair share of trials to Talon, she speculated where her life may be if she had not had these health issues. “Nothing was enough for me – I always wanted more, but now my whole outlook on life has changed. I feel very differently now about drugs and alcohol and things that are not good for my body. It’s so special and after all I’ve been through, I appreciate what I have and don’t take things for granted. Young people can make bad choices because of life experiences and I feel blessed to look at life differently at such a young age,” she said. When asked how she manages living with chronic illness, she said, “When I first had ITP and my platelets were super low, I met this little boy (he was 6 or 7) with a port and he had all these toys and the nurses were always playing games with him because his family was hardly ever there. They could never tell me what he had, I just knew I got to leave after a few days and he didn’t. I got to go outside, and he hadn’t been outside for months, so when I’m feeling down, there’s one word that makes me think of him and helps me fight – perspective – I even have it tattooed on my back with the medical symbol,” she said softly. “I don’t know how he’s doing or if he’s better,” she continued, “but when I’m at my lowest, I know there’s always someone worse off than me. I’m allowed to cry and feel sorry for myself sometimes…just not too much,” she said humbly.